Mrs. Linda Sue Whittenton Best, 76, of Dunn died Sunday evening at SECU Hospice House in Smithfield. She was born in Harnett County on May 12, 1942. She was preceded in death by her father, E.M. Whittenton, a daughter, Gena Lynne Best and a sister, Kay W. Westbrook. Linda graduated from Dunn High School in 1960 and attended Campbell College. 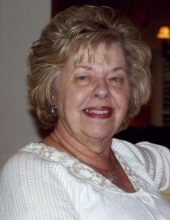 She was co-owner and book keeper of Whit Truck Brokers, Inc. for over 38 years. Linda was a very kind and uplifting person. She loved spending time with her children, grandchildren, and most recently her first great grandchild. She also talked about the fond times spent at White Lake. A funeral service will be held Wednesday at 2 p.m. at Skinner & Smith Funeral Home by Warren Williams. Burial will follow in Memorial Park Cemetery. She is survived by her husband of 58 years, Gene Best, a son, Michael Best of Dunn, a daughter, Suzanne B. Neighbors of Youngsville, her mother, Lavenia Whittenton, a sister, Dale W. Johnson and husband Nat, five grandchildren; Hayden Neighbors and wife Jessica, Falynn Neighbors, Blythe, John Michael and Luke Best, a great grandchild, Hank Neighbors, and several aunts, uncles, nieces and nephews. The family will receive friends Wednesday from 1 to 2 p.m. at Skinner & Smith Funeral Home. To send flowers or a remembrance gift to the family of Linda Sue Whittenton Best, please visit our Tribute Store. "Email Address" would like to share the life celebration of Linda Sue Whittenton Best. Click on the "link" to go to share a favorite memory or leave a condolence message for the family.